No Rental Car on Oahu? No Problem! If you don’t plan to rent a car for your Oahu vacation, you don’t have to limit your outings to those within walking distance. Instead, consider renting a moped, scooter, or three-wheeled car to get you where you need to go. They’re affordable, easy to maneuver (mostly), and can help you avoid Oahu traffic, which could save you precious time on your vacation. Once you’ve decided to rent a moped, scooter, or three-wheeled car, it’s time to figure out which is appropriate for your needs. So, we wondered, when it comes to scooters vs. mopeds vs. three-wheeled cars, what’s the difference? Turns out, a lot. According to Brad Freseh at Hawaiian Style Rentals and Sales, a moped is a single passenger vehicle that has a 49 cc engine and can reach speeds of 35 mph maximum. You only need a driver’s license to operate a moped, which means most travelers can operate one legally on Oahu. If you decide to rent a moped, you will find there are limitations to where you can go, but not many. Freseh says you are allowed to drive a moped on nearly every road except three: the H1. H2, and H3, Oahu’s main highways. You must drive as far to the right as possible and in single-line formation. The good news? You can drive your moped in the bike lane and avoid the dreaded Oahu traffic. 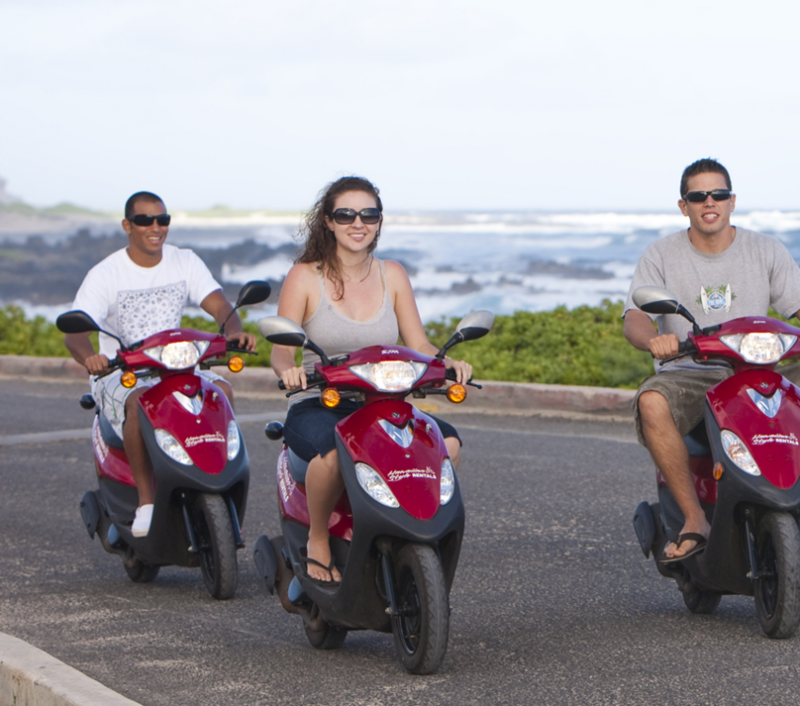 Prices vary among competitors, but, at Hawaiian Style Rentals and Sales, you can rent a standard moped for $40 for 24 hours. If you want a 7-day rental, the price goes down to $25 per day. After seven days, the price is $11.95 per day. The Honolulu Police Department says there have been 20 moped accidents on Oahu so far in 2015. But, what if you want a little more “ooomf” in your engine? Then, a scooter may be the right choice for you. According to Freseh, scooters have more engine-power. Specifically, scooters’ engines are larger than 49 ccs. They can carry two passengers and reach speeds between 45 and 120 mph. There are no road restrictions for scooters, but, of course, you must obey all traffic laws and posted speed limits. But, here’s the catch: in order to drive a scooter, you must have a motorcycle license. If you do your homework ahead of time, you can take the written test and driving test on the same morning. At Hawaiian Style Rentals and Sales, you can rent a scooter for $95 per day. The seven-day rental rate is $55/day, and, after seven days, the rate goes down to $22.40/day. If you have two passengers, but no motorcycle license, you may want to consider renting a three-wheeled car. It can carry two passengers and has the same engine as a standard moped (49 ccs). You are limited to driving in Honolulu, but you only need a drivers license to operate the vehicle. Keep in mind, you must be 18 years old or older to rent a scooter, moped, or three-wheeled car. Passengers must be seven years old or older. Hawaii does not have a law requiring drivers or passengers to wear a helmet, but, at Hawaiian Style Rentals, all renters and passengers must take one, and they’re encouraged to wear them. View more safety information on their website. 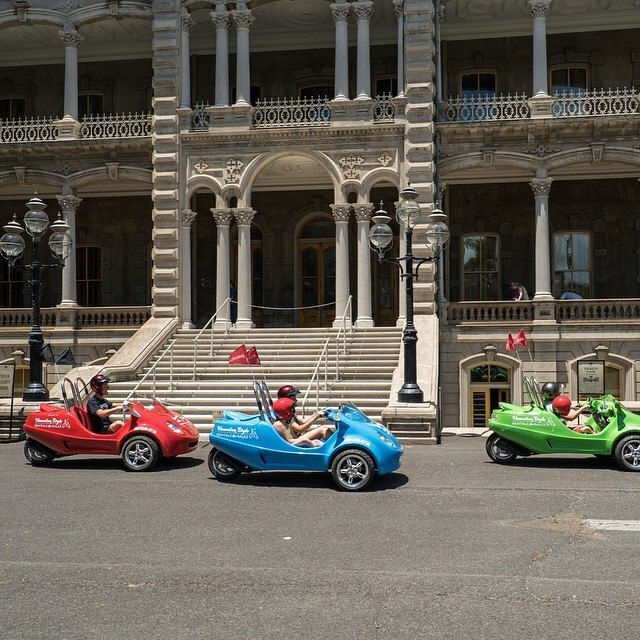 If you’re visiting, but have no rental car on Oahu, you can still drive around the island in style. But, make sure you have all the information you need before you decide which vehicle is right for you.